A broad variety of approaches exists to estimate an appropriate distribution and its parameters, when given a sample of data. They contain among others: unbiased estimators, regression methods or maximum likelihood estimator (see e.g. [118, 98, 158]). 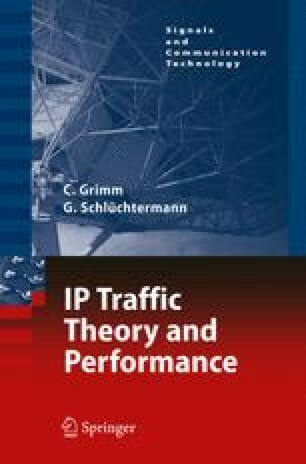 In this chapter we introduce relevant estimators for characteristic properties of IP traffic. We start with some standard estimators and later introduce appropriate approaches with regard to IP traffic. Further details on basic concepts of parameter estimation are summarized in monographs like .